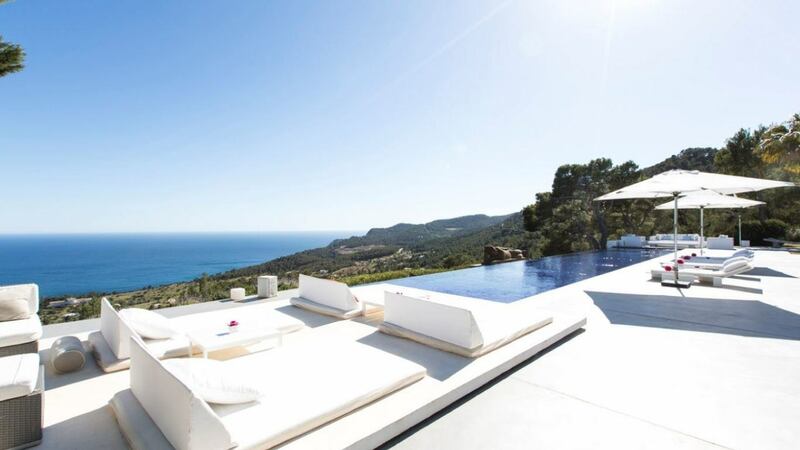 Ibiza is one of the most beautiful islands in the Balearic Islands and the Mediterranean Sea. With over 50 beautiful beaches on the stunning coastline, the sunny island of Ibiza has many excellent expanses of fine white sand and clear blue waters. Some of the best beaches on Ibiza can be found along the island's Southeastern coast, between Santa Eularia des Riu and Cala de Santa Vicent. Ibiza enjoys Mediterranean climate, with mild winters and hot summers with each season offering something unique to visitors to the island. During July and August, the weather is both hot and sunny and there are over 12 hours of sun each day in Ibiza. Ibiza boasts more than 100 miles of coastline with some 50 beaches, plus plenty of restaurants, bars, water sports, and night clubs. You can visit Ibiza either during the summertime, or winter time, when the island has gone quiet from the party goers and you can see it's quiet aspect. The biggest criminal threat in Ibiza is bag snatchers and pickpockets. Thieves are very skilled, so be particularly careful with hand baggage. Wear a bag or camera across your body, or even use a concealed money belt. The town is small enough to explore by foot, although roads are very steep so a long walking tour can be tiring. LVH Global also offer car rental services for you to explore more distant parts of the island. Flights to Ibiza arrive at the Ibiza Airport, which is located only 7 km from the center of Ibiza Town. The airport caters to tourists with travel agency desks, tour guides, and duty-free shops, as well as the typical restaurants and cafes. There are banks with ATMs and a bureau de change, and guests have access to a pharmacy, first-aid clinic, and chapel. Hospital Can Misses is public hospital in town. Should you need any medical care, contact our Concierge Team at LVH Global to provide a list of doctors who speak English. You must carry your passport with you by law. If driving, you must have two warning triangles, two reflective bibs, a spare tyre and spare headlamp bulbs. Children under 12 years of age are only allowed in the front seat with approved safety belts. It is not usual to share tables, even in fast-food joints. Anyone you are introduced to by friends will want to kiss you on both cheeks, but this does not apply to hotel staff, etc. Lunch happens from 2pm, dinner from 9pm at the very earliest, though 10pm is the norm- although you can eat at any time in resorts. The dialing code for Spain and the islands is +34. The top mobile operators are Movistar, Vodafone and Amena. If your phone is unlocked, you could easily find a mobile boutique right at the airport. If you don't have an unlocked phone, you might contact your service provider before you leave. The religion of the majority of the population in Spain is Catholicism however less than a quarter are now thought to be regular churchgoers. Because the government of Spain is now a secular one, it can no longer be said that it is the official religion but the Catholic church still receives special treatment. Spain is still a Catholic environment, its landscape filled with shrines and churches, and has an artistic heritage rich in religious reference, language and customs. It is worth noting that almost every Catholic church in Spain is a museum in itself with many well worth visiting. Islam is the second largest religion accounting for about 3% of the population and there is a small representation of Jewish and Protestant denominations. Incase of emergency, the police, ambulance and fire emergencies can be reached by dialing 11. Tipping is quite discretionary, with taxi drivers usually being given a 5 to 10% gratuity or thereabouts, although this is by no means obligatory. Restaurants always include service charges by law, and these should be clearly stated on the menus, although a small tip will still be expected and very much appreciated. Hotel staff, such as luggage handlers, happily accept a small tip. Generally, no other public service workers expect tips. Although the local water is generally safe to drink in Ibiza, we recommend buying bottled water. Drinking iced beverages in the blazing Ibiza sun will cause severe temperature clashes in your system which can lead to upset stomachs, sore throats and dizziness, therefore, it is best to stick to body-temperature drinks in the sun and leave the iced drinks until you are sitting cooler in the shade, or later in the evening when the sun is going down.